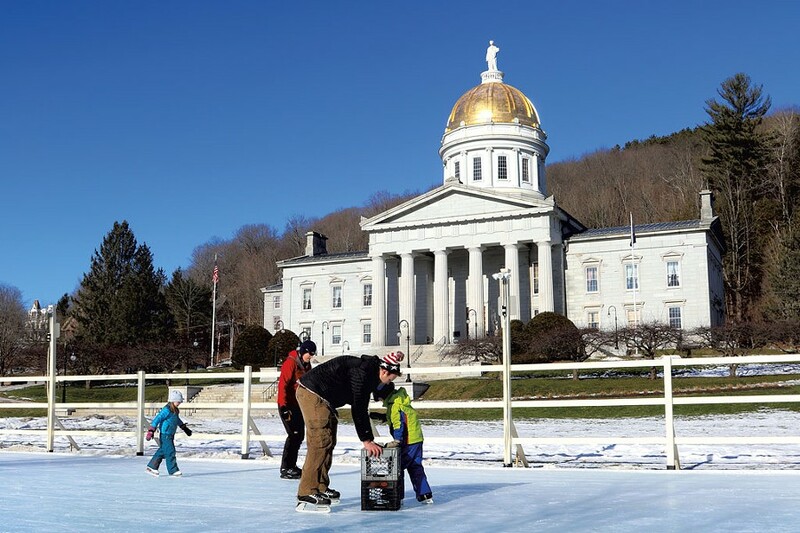 Statehouse Skating | Fit Families | Kids VT - small people, big ideas! The image of community members skating together was on Montpelier resident Nate Hausman's mind when he posed this question at a dinner party: "Wouldn't it be cool to have an ice rink on the Statehouse lawn?" The guests concurred, and, with the encouragement of friends and community members, Hausman decided to make it happen. He formed a small committee and brought a proposal, dubbed "Put a Rink on It," to decision makers in Montpelier, including the Department of Buildings and General Services and the Capitol Complex Commission, a committee responsible for the outside aesthetics of the Statehouse. The design group at Montpelier Alive, an economic development association, helped guide the proposal process. It took two years to navigate liability and fundraising issues — and some obstacles Hausman never imagined: "everything from bathrooms to parking to not taxing the tunnels that run underground below the Statehouse lawn," he said. His committee cleared every hurdle, including raising $10,000 for a contingency fund to cover any damage done to Statehouse property. Finally, in early January, the 40-by-80-foot Rink at State Street opened for skaters. It's intended for open skating only; hockey and broomball are not permitted for safety reasons. Volunteers help with rink maintenance and supervision. On a sunny but cold Martin Luther King Jr. Day, several families navigated the rink. Some kids skated easily on their own, while newbies used crates or held parents' hands for support. Smiles flashed all around. "I'm sure there are some tears, too, when they fall, but they get back up and keep going," Hausman said. "Seeing little kids out there, finding their skating legs, it's good to see." Despite the challenges, Hausman said, he remained committed to the project because it was an opportunity to get people outside and to build community. Plus, he added, "It shows what just a few private citizens with an idea can do." The Rink at State Street is operated by the City of Montpelier, with help from Montpelier Alive and community volunteers. 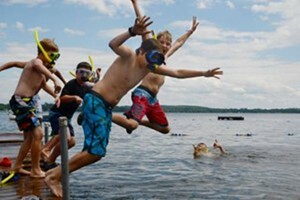 National Life Group Foundation and Vermont Mutual Insurance Group provide financial support. The rink is lit and monitored from 3 to 7 p.m., Wednesday through Friday, and from noon to 7 p.m. on weekends. Skating is free, and skaters can buy or rent skates at Onion River Sports at 20 Langdon Street in downtown Montpelier. montpelieralive.org/222/the-rink-at-state-street.